This week was another of just rest and relaxation as much as possible. I planned on doing a show over the weekend, but instead a raving migraine and a big rain storm kept me at home. I probably would have gone to the show if it was sunny and I had a headache, or if it was raining and I felt fine, but the combination of the two was too much for me to take and to try and work through. Monday: I went to the bank to make my deposit- accidentally depositing the money I use as change in my cash register- forcing me back to the bank on Friday for money for the show that I ended up not going to. I paid bills, caught up on laundry, ran the credit card sales from the show, got out an order, and did some other miscellaneous paperwork and phone calls. Tuesday: I got my hair cut. I really like my new hair stylist. Her name is Sandy and is at the Artisan Salon & Day Spa here in Emmaus. I also went to the grocery store in the hopes of actually cooking some real meals, went to the post office, and made an appointment to get my oil change and a recall on my van fixed. Wednesday: Not much during the day other than making soap, but at night we went to dinner with B&M to celebrate M’s birthday. We got him a trivia game based on the Soprano’s. I think he wishes he grew up as part of the Italian Mob. Thursday: Made more soap. I really need to get caught up on some inventory. I don’t think I have enough lye in the house to get what I need to get made completed. I’m dreading the drive to go pick up more. Maybe B will want to come and we can make it a day trip. Who knows? Friday: I got up and got my oil changed and my van fixed and inspected. I dropped off some soap at OOOH and then quickly got home, because my stomach was starting notteo feel well, and who likes to be sick in public? Not me. When C got home from work we talked about going and setting up for the show but decided that my tummy wasn’t ready for a port-a-pot, or lack there of, so we decided to wait till morning. Good thing, around 9pm my head felt as though it had split open and my brain was trying to escape. Then around midnight it started raining and thundering so hard I don’t know if my tent would have made it through the downpour if I had set it up. Saturday: Around 5 am I finally got relief from my headache enough to get some sleep. We had decided about 3 am not to go to the show. I struggled with the headache all day, so much so that we skipped the opportunity to go to Atlantic City with B & M for the day. The thought of being in a moving car just didn’t sound like any fun. Add in the incessant jingle of a slot machine and I think I would have lost my mind…Around 7 pm I started to watch the NASCAR race and couldn’t make it through- so glad we have a TiVo. Sunday: Headache gone, but still lots of rain. Boy was I glad I didn’t go to that show. It rained so hard we didn’t even go up to look around and get some good food. Instead we rearranged the bedroom, getting rid of an armoire and adding shelves to the closets. Now we just need a set of drawers. This week really was just getting done with one show and then turning it over and doing another one. Monday I had to go to the bank and make a deposit, answer phone calls, pay bills, and order ribbons for my merchant credit card machine. That night B and I took a cosmetics class. It was fun to spoil myself for a few hours. Tuesday I printed flyers, packed the van, cleaned my displays and table covers, did laundry and packed inventory. Wednesday: J came in the late afternnon. C and I met in Lansdale and then drove to set up the booth, before coming home and having dinner with J.
I don’t know if I like my biggest shows being back to back like this. It is just painful. I hurt, I am behind in the housework, I am behind on orders, I am behind on e-mail, I am behind on sleep.. But I can tell you one thing, the deposit slips make it all better…. Day 2 the last few weeks really started setting in. I was darn tired. After getting up way early to wrap some bath fizzys, the day was just way long. I can’t say enough about how pleasant and fun this festival is for me to do, and the sales don’t hurt either. Saturday was an exceptional day, and I really believe that having a corner booth and having it located where it was located had a large hand in how well my sales went. I am now interested in spending the extra money (often corners cost more) in a few other shows to see if getting a corner booth increases my sales by enough to warrant the expense. Sunday was my best day of sales ever. I cannot believe the response that I got from the customers. I really though after Friday and Saturday going so well, that Sunday would be a dud. It started out really slow because of the heat and humidity, but picked up in the late afternoon and then just didn’t slow down. Load out was a breeze. Although we choose to wheel out all of our stuff, rather than bringing in the van, it was still simple and so extremely well organized it is amazing. Like all shows not everyone is happy all of the time, and many people didn’t do well, or as well as they thought they should. Some started packing up pretty early, others stayed open late to try and get the last remnants of people as they left the late concert. I stayed open a little later and then just got tired and decided to pack up. I also got some wonderful trades- earrings and an anklet from Isis, and another set or earrings and a pin from a couple that my dad bought from last year. I also did some shopping, some earrings for a gift, and some (ok lots) of yarn for me. I think I have enough yarn for 15+ projects now. I need to get some serious knitting done. I just need some serious down time to get in done during. J told me that there is a new yarn store in Saratoga now too, I’ll have to bring my mom when I am there for her birthday. 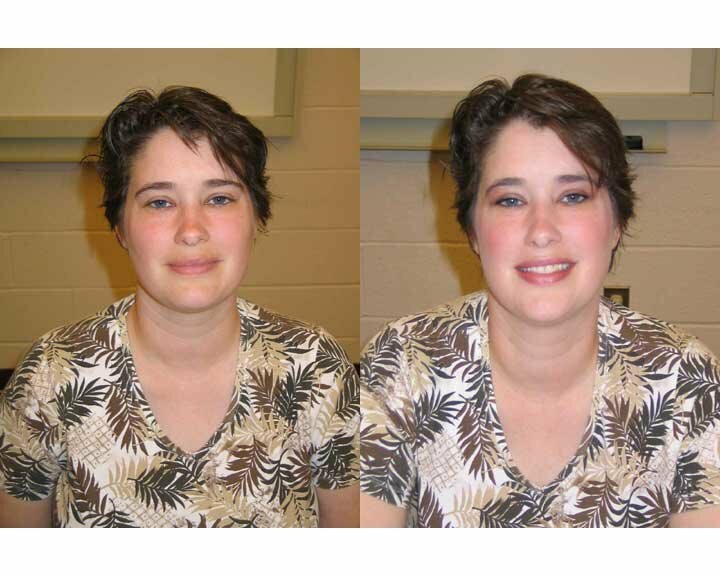 So the day after Musikfest B and I took this Cosmetics class at the local college. I figured that it has been yeas since I have seriously put on any makeup, and that a brush up on what my best colors are would be a good thing. So the first picture is my before shot. It makes me look really, really tired, but I was so I guess that is OK. The second shot is my after picture. I think I look pretty good, a little more polished, but not excessive. The first day of the festival this year has been terrific. First, I have a corner booth, so I have great visibility, plus my “smellies” get out into the public, for some free advertisement. I have a great location as well, as just about everyone that comes in or out can see or smell me. So on that note, sales exceeded expectations for me this year so far. If this keeps up, I will be one happy camper. They are calling for some rain on Sunday, so we will see how it goes. There are a lot of crafters this year, over 50. And many new ones, different, than last year, and some that I know from other shows as well. I’m already working on the barters (big surprise) and have some great ideas for things that I want. The kicker is, some of the things that I thought would be here aren’t, so I don’t have the opportunity to spend money like I thought I would. Breakfast was good, French toast, cereal, and juice. Lunch was wither a chicken Cesar salad or a veggie burger with a salad, along with some corn, a roll, a drink, and a popsicle. Like last year they came around to get you change, give you water and/or ice, and generally just be really, really, nice people. J was with me and she agreed that this really is a special show. I had a good amount of repeat customers which was really nice to see. Some bought for them today and say they will be back for gifts on Sunday. That would be cool! But the first day is the longest. We came in early so we could get J’s badge (which wasn’t in the computer), set up, and get breakfast, as well as avoid the crazy traffic. We succeeded, but it made for an 18 hour day. So sleep came quickly, and not for long enough…..
Well, I guess I didn't have enough support, or just wasn't cool enough to make it farther than the nomination. I'm not listed as one of the three you can vote for. That is OK. I think it was so cool that Katy thought of me to nominate me. I did take a look at the other three, and I did vote. Because who likes a sore looser? C was out of town Monday-Thursday in Mexico for work. Over the weekend the handyman came and installed the bedroom ceiling fans. Well the show ended for me on a high note with Sunday being the best day of the event. It is already being published in the paper that this year’s event has been the highest attended ever, with somewhere over 1 million people in over 10 days. I will admit, my sales did not reflect that this was the highest attended event ever, but with Sunday being as strong as it was, I made out almost as I did 4 years ago- my first time at the show. Tear down was surprisingly civil, typically there is at least one yelling match, but alas, there wasn’t. There is however a lack of direction and assistance from ArtsQuest at the end of the show. I know they are busy, and that they trust us to be adults, but there really should be someone directing traffic. The people next to me that have the huge trailer, surprisingly didn’t pull it in and block everyone like they have in years past, but pulled it in to the side and hauled their wooden signs rather than loading right into the trailer. I also, like every year, make some wonderful trades. I got a necklace from Autdemna Jewlers (http://www.autdemnajewelers.com/home%20page.html), some hanging pots and a lamp from Acorn Tinnery, some prints for the girls (K&M) from James Browne (http://www.jamesbrowne.net) , and a bracelet from J & F, whose company name escapes me right now. I also acquired some leads on some other shows that I need to look into doing, lots of great ideas for soaps for next year, and a lead on doing some sales through a local high school band as a fundraiser. All in all this has been a pretty profitable show for me and if these leads pan out, it will be great. A Plummy in my future??? Thank you Katy for you recognition! Nominations are being accepted until August 15th and you can learn more at http://plummies.plumofthemonth.com. If you have other favorite crafters, be sure to nominate them… Just not in the Bath and Body Category… I want this so bad I can taste it!!! So starting August 15th- vote for me early and often! The winners will be announced September 1st. But really, its like getting nominated for anything- it really is the nomination the counts! It was day 9. Just 1 to go, and we started counting down the hours before the day even officially began. I love my customers, and I consider everyone who steps into my booth a customer, whether they make a purchase or not. I want my customers to be happy, and informed, and generally enjoy their experience. I want them to equate coming into my booth, getting a chance to smell the good smells and having a pleasant conversation with me, with having an overall good time. I want them to come back year after year, a sort of tradition. But by day 9, as I smile and chat, there is a little devil on my shoulder yelling “buy something or get out, can’t you see I’m tired, and thinking hurts my head”…it never comes out of my mouth, and the angel on the other shoulder always wins, but in the last of these long, strange days, the struggle exists. Not always, but sometimes…. I also have a hard time with the prevalence of debit cards and the use of credit cards. For a typical $10.60 transaction paid for with a credit card, I loose .60 to state sales tax, .32 for the credit card fee, and an additional .45 for the processing of the transaction itself. That leaves me with $9.24 for the purchase of three soaps (or about $3.08 each). Now, I cannot legally (or for me ethically) put up a sign asking for a minimum purchase for credit card use. This is a no-no and could lead to me loosing my merchant account if someone complained. But I don’t think we as a society think about exactly how much money the credit card companies and the merchant processing companies make off of our use of these cards. It really costs, and do you think the Wal-Mart’s of the world just write off these costs? No they pass them onto the consumer. It is the little guys like me that get stuck. I need to accept cards, or loose a sale altogether, but I don’t take enough of them to feel like it is fair to pass on the added costs to every customer in the form of a price hike. And it is not legal for me to pass them onto just the people using cards, or legal for me to ask them to make a minimum purchase to help defray the costs either. I mean, yesterday I took a card for a purchase of $3.98- my take after all the fees and taxes- $3.18, about 15% less than I would have if it was paid with cash. Oh by the way, sales wise it was the best day of the festival. I really did well. The weather was beautiful (even a little cold at night) and people were enjoying their evening. I can’t believe the number of repeat customers that have come in and told me how much they enjoy my products. Although I am tired physically, it sure has been good to rejuvenate my spirit. It’s at the point in the show where I feel like Frankenstein’s Monster when I get up in the mornings. My eyes are glued closed with sleep, every bone in my body hurts, so I lurch down the hallway, and my brain has totally turned off- if I haven’t written it down, it just ain’t getting done. I can't believe that after this I have to spend a day cleaning the tent/displays and repacking, so I can go set up again on Wednesday at the Phila Folk Festival. But it only takes one good night of sleep to put it all right. Friday has been my best day of sales yet. The list of soaps that I need to make is growing and it looks like I’ll have a pretty bust last week in August, first weeks in September catching up. I also have been selling bath fizzys like crazy, so I will need to make about 700 of them before folk fest in order to have any inventory at all. The lip balms seem to be pretty popular in their new tubes as well. I have also started working out a deal to sell a soap and a lotion bar in a seed catalog. Hopefully I’ll have more info on that in the coming months. And finally, I think I have killed my printer. I as way too much of it, and we have started searching for a higher quality, faster printing color laser printer. Let me know if you have any suggestions. 2) I was paid the highest complement I have ever been paid. A woman came into the stand and bough bath fizzys. She explained how she buys them for her mother for Christmas every year, and how her mother has come to expect them. She also explained how they store the fizzys in with all the other Christmas gifts, so that everything smells nice by the time its wrapped for the holiday. But at the end of the transaction she thanked me “for the tradition”. Wow, those are the moments I live for. I’ll at least give a few minutes of thought this holiday to that family and to that mother, and how my little bath fizzys have brought her joy that day. OK… I digressed enough, on to the show. Since I didn’t blog Monday I’ll do it here (because although its only a little over a day ago, who can really remember it?). I have been told by a reliable source that Monday’s attendance was the lowest they had in 4 years. My sales showed it. (Although they were better than Sunday, so what does that say?). There was a chance of rain and thunderstorms all day, so I liked to use that as an excuse for people not to come out. So B And I got to chat all day. And really, that’s all I really remember. Tuesday… I got a chance to read a few of my magazines that I am behind on, and started formulating a plan for 2007 already. Scary ehh? I have recently equated my life much like a roller coaster. January is when you get in the ride vehicle and you are a little scared, but mostly excited, are spending most of your time chatting aimlessly with your friends. February is when the brakes come off and you start your ascent, hearing the track click away as you start up the first hill. March and April you come to the top and are anticipating the big drop. May and June is a trick, when you only plummet down a little ways, just to be hauled back up and ever greater, steeper incline. By the end of July you are at the highest point of the ride, scared for your life, and the beginning of August is when you plummet, stomach in your throat. September through December you just hold on for the ride, all its twists and turns.. and a week before Christmast the ride comes into a stop in the station. The feeling of being on solid ground, and the oppressive tightness of the harness being released is a prayer that has been answered. But before you even get out of the building you want to ride again, and Christmas through New Years is waiting in the queue line for the car in the front row. Oh, the show… I did better than I expected. Weather was nice, but a little windy during the afternoon. Nothing of any serious interest to report…. This week was mostly prep for Musikfest: getting things done around the house, making some inventory, and just trying to rest before the storm. Monday: Made about 60 new samplers, started labeling lip gloss containers, finished the small poncho for K I was knitting, and started another adult one. Tuesday: Print flyers for the show, mail out an order (now that it cooled down it won’t melt in transit), mailed an ad out for a program for a show that I’m doing in November. Made Oatmeal, Milk, & Honey bath fizzys. Wednesday: Wrapped the fizzys, cut up soap to put it to cure, went shopping with B- I bought beads for some shawls I knit, some yarn, and a pair of shorts for me and some shirts for C. Knit the rest of the evening. Thursday: Besides setting up for the show (see the Day 0 post), I ran to the post office, and we went out to dinner with B & M.
Friday: Other than Musikfest, I picked up some groceries, did laundry, and blogged. “I” was here at night staying with us. Saturday: Didn’t do much else besides Musikfest. “I” was here at night. Sunday: Besides Musikfest J came into town on the afternoon. She came over to the show for a while, but she had to get up early to leave for work so she didn’t stay late either. The day started off very slowly, and although sales picked up later in the evening, I was surprised that I sold much less than it felt like I sold. There are always days like that- days where you feel super busy, only to come home to count the money and be disappointed, and some days that feel long and slow, but surprise you at the end. The three day total is acceptable, but below what I had been hoping for. The long range forecast is calling for great weather next weekend, and at night during the week, so I am being hopeful that in the end it will be a good show. For the past four years I have befriended a volunteer that I’ll call “K”, well it is her time to grow up, she goes to college in just 20 short days. I wish I could afford to get her what she really wants- a drum- but instead I will try and see if I can find her something cool as a going away gift. I see so much of myself in her it is scary. I think going away to school will be a great experience for her and I’m glad that she has promised to come back next summer too so she can tell me all about it. I knitted another washcloth, this one came out better. It is still looser than the ones my mom makes, but as B pointed out- so what- it gives people a choice. I just can’t get over comparing mine to hers and thinking that mine look so inferior. But B is right, to the customer; they just see “different”, not better or worse when it comes to knitted dishcloths. It has only been two days and I am physically wiped out. My feet hurt, my legs hurt, it must be funny to watch me walk around the house and down the stairs until I get all the kinks worked out. I don’t remember craft shows tiring me out like this. I usually feel like this around day 7, not day 2. And no matter how much I try and sleep in, I am wide awake around 6 am, and just lay there till 7, listening to the cats beg for food. Sales seem pretty strong this year. So far I am happy, but only the days during the week will really tell for sure. The weekends are usually pretty good, its those days during the week that really make a difference in the overall bottom line. Overall the day was quiet and uneventful. B and I are trying to figure the “theme” of this years attendees. See last year it was like every other person had on “Cabella’s” merchandise, or was smoking a cigar. This year the cigars are much less popular, and I have seen few Cabella’s branded hats or shirts. What I have noticed is the trend of women to wear black bras with clothing that you can see them through (like pink wifebeaters), and more and more tattoos. I wonder, as tattooing goes more mainstream, what will the “rebels” amongst us do to differentiate themselves? I also have a comment about Goth- last night Alice and Chains preformed, so there was quite a bit of what I think of as Gothlite – all the black, none of the makeup. Now I understand this is a fashion choice, a way of life choice, but geeze, it was 90 this afternoon, where does common sense overcome fashion sense. It makes me hot just thinking about how hot they must be walking around in the sun in all that black. I also knit my first washcloth. My mom usually makes them, but I asked for the pattern. I am less than happy with my tension. And I tend to slip knit wise and she slips purl wise, so once it is done, upon inspection you can easily tell which one is mine. I stated another one with one size smaller needles so I hope that will help make mine look like hers a lot more. I am the Queen of Craft Show Karma. What is craft show karma you may ask? I believe it is when one crafter does something nice for another, and eventually it comes back to you- when you need someone or something at a craft show, someone will be there for you. Its sort of a “Pay if Forward” idea, but just more limited to art and craft shows. This was the day for me to charge up that karma. “I” who has a booth a few down from me and who in past years has been my neighbor, started chatting and mentioned that she could not find a hotel room for the next two nights and planned on sleeping in her van. Now she is not a kid anymore, and with this terrible heat that we have been agonizing through, I just couldn’t let her do it. So for two nights she is our guest, until she can check into her hotel on Sunday. Later that morning another a few down the other side of me didn’t have a long enough extension cord, so my trusty electrical bag got opened and they will be using mine until they bring in another. But I think some of this love has already been paid back- in spades. See, C and I were talking just the other night about how tired I was of craft shows, and show mentally beat I was. We were talking about alternative paths I could take, and when I should take them. But the show today was just amazing. Customer after customer commented on my new displays, on my new labels, on how much they enjoy watching me grow from year to year. One said that it was his pleasure to watch me and my business evolve. Wow… that one is gonna stick with me for a while. It was just the boost I needed at the exact time that I needed it. Oh yea, and I made pretty good sales too. It is amazing- every show I do- no matter where I do it, no matter when I do it, no matter how long it has been in existence and how long the promoter has been promoting it- something has to go wrong. I arrived around 5 pm- to realize that there was an electrical box in the space where my tent was marked to go. And the electrical line running to it was hung so low that even if I moved my tent over a foot or two, I couldn’t put it at full height (or any height for that matter) without having this huge wire draping on the top of my tent. So I called JH. JH is the Events Manager. I’m an old soul, so I think of him as a young kid, but really in age I’m only I guess about 5 or so years older than him. But he was lovely- he came right down, called the electricians, got it taken care of, and I got to set up. B is next to me, so while this was happening, she and M showed up to set up and had to wait till the electricians on the bucket truck came in and fixed the mayhem. Then they set up too. I have a shiny new tent, a tent that when the wind blew in almost blew into the creek that runs behind the tent. I FREAKED as I was in it, sitting on the ground as it started to tip. And I had no clue who was around me and where they were and if they could help. Luckily C was there (I just didn’t know where) and B grabbed it as well, as long as a kind stranger crafter who came rushing to the rescue as I scream at the top of my lungs for help, as I visualize my new spiffy tent floating down the stream and me starting to pray that BJ’s had another one. After we set up, we all went to Perkins, where the food was good, but the service was slow. It started raining, hard, so hard that the window in our booth started leaking and raining in the inside. So after we ate, C and I went down to check on the status of the tents- to be sure that no branches fell on the tents, to be sure there were no gaping holes in the top or sides. We made it through fine. The oppressive heat of the last week has started to break. We’re gonna have a great show, I can just feel it.